Third is a top end rpm limit to protect your motor from overev. The starting line limit can be controlled by the Trans Brake, Line Lock or a Clutch Pedal Mounted switches. This requires the use of (2) buttons: one for the burn out limit and one for the starting line limit. Note: rpm or retard modules sold separately. 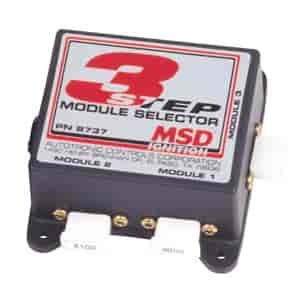 MSD offers 2 and 3-Step RPM Controllers that allow you to control RPM limits for consistent and steady RPM levels that result in firm launches. 8737 is rated 5.0 out of 5 by 1. This is compatible with the MSD 6AL box. This will not work with MSD Digital 6.